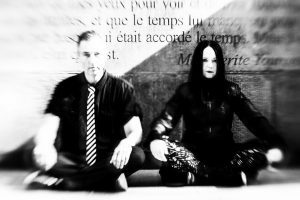 Brussels based goth-rock formation Lovelorn Dolls is back on track. 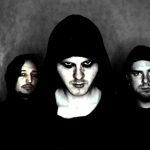 The band’s third album “Darker Ages”, released on Alfa Matrix, is their first new opus in four years. Core members Corpus Christi and Ladyhell went through personal issues, which explains this hiatus, but it also had a positive effect on the global production process. The new work is without a shadow of a doubt their most mature and accomplished opus to date. There’s a brilliant harmony between gothic-, rock-, metal- and pop influences. Corpus Christi and Ladyhell told me a bit more about this new work. Q: The first album is always something special and magic, the second album is often difficult as you’ve to confirm your potential, but a third album is a kind of milestone in a band’s career! Do you agree with this statement and how do you look back on your career so far? Corpus Christi: Well I think the third album is what was meant to be at this moment of our lives. Ladyhell and me went through some personal issues and this impacted the compositions a lot. It is like a catharsis. Now looking back to the past… Well I’m proud of all the albums we recorded. I cannot say that I do prefer one among the others. Each one of them was composed in the mood of the moment. On “House Of Wonders” there were a lot of more happy songs like “No-Life” or “Euphoria” because we were in a good mood. The themes were more generics and less personal. Q: “Darker Ages” has been introduced by your label Alfa Matrix as your darkest work to date reflecting personal issues and horrible events of our daily life. Tell us some more about these themes and what do you think about music as a therapy or cure to exorcize feelings of pain? Corpus Christi: I’m personally unable to compose when I’m in a bad mood, it’s only when I take some distance with the events related in some songs that I’m able to put them in music. When I had some troubles I had no taste for anything even listening to other people’s music. Then it came back. For me it started again with songs from the French band Kyo. I discovered that almost all the songs from this band are related to sentimental problems, end of relationships and I recognized myself in the lyrics and the music. Q: “Darker Ages” is without a shadow of a doubt your most mature and accomplished work to date. What do you see as the main evolution(s) and challenge(s) between this work and previous albums and what has been the impact of Maxx (Helalyn Flowers, ImJudas) on the sound production? Corpus Christi: The third album was entirely recorded and mixed in my very small home studio. Maxx took care of the mastering. He did a great job in order to give the final touch that was required to enhance the mixes. I wanted to take some responsibilities and so I wanted to have less external input this time even if there are some mistakes in the production. Q: I’ve been always fascinated by the contrast between music, which is mostly meant to give people a good time or to get them happy and bands dealing with dark themes. But we also know it sometimes happened the other way round (reminding the impact :Wumpscut:, Marilyn Manson ao had on teenagers). I would like to have your opinion on this theme? Corpus Christi: In my opinion music is only meant to give people emotions, the emotions could be joy.. or sadness. Also all of the songs in “Darker Ages” are not sad. It’s more like a concept album with the theme: from darkness to light. The order of the songs is important and we took some time to sort them out. In the previous albums we had more ‘commercial’ views I must admit so we wanted to put the most catchy songs first. Q: What’s the importance to play live and what can you tell us about further performances in Belgium and abroad and will your fans discover new elements on stage? Ladyhell : It’s important to play live to meet your fans and reach new people. We are not going to perform this time because the search of live dates is getting harder and harder. We prefer to put our energy in studio. Q: Kristell, I noticed you’re part of the worldwide community ‘Eve’s Apple’. What is this community all about and how does it work? I also want to get your opinion (maybe experiences) about being a female artist in this music scene (considering items such as sexism, equality between male- & female artists etc)? Ladyhell: The community Eve’s Apple has disappeared around 2013, I think, so it’s no longer on the market. I don’t really had bad experiences about being a female artist. It’s the contrary, being a female surrounded by males can be really nice, you’re like the ‘precious’ thing and the guys take care of you (laugh). As the lead singer, you are the one in front of the audience. It gives pressure, but it’s also nice because you have most of the contacts with the fans. I always liked to be surrounded by men only because girls can be really mean with other girls. Actually the only problem I had was with the girlfriends/wives of the musicians… there was always a problem, jealousy issue, … and I was really not the problem, they just missed lack of confidence. The new Ruinizer album (and single) are out now... and already half sold-out!